A Visit to Flambeaux Bicycle Tours! Put your helmets on folks. We’re going to saddle up on my multi-mirrored motor scooter and go for a little ride. Welcome to my New Orleans life. Thrills! Chills! Happily, no spills! It’s a visit to Flambeaux Bicycle Tours, our favorite bike tour company in New Orleans. All aboard! In New Orleans, everything seems larger than life, even the proprietor of the smallest hotel in the city. Frau Schmitt is out of town today so I am running the show by myself. She is the better half of this operation, but I can manage to run the show by myself for a few days solo. Things tend to be a bit less organized when it’s me in charge but everything usually works out just fine—the New Orleans way. After breakfast, I was running errands and my route led me down North Rampart Street. It was the perfect day to pop into Flambeaux Bicycle Tours. Eric, the owner, was in. Eric sometimes calls me Matthew King, which is my name. He sometimes calls me Matthew Fox, who is someone else. Today, I was Mr. Fox. I don’t correct Eric. Next time, I’ll be Mr. King. No worries. I am crazy like a fox. Since he’s looking at me when he’s talking, I know who he’s referring to. He always seems happy to see me and I don’t think it’s an act. He is naturally enthusiastic. I like Eric, and not just because I think he likes me. He’s crazy like a fox, too. Eric runs Flambeaux Bicycle Tours, the bike tour company we recommend to our guests visiting this wonderful city we call home. If I owned a bike tour company, I’d run it like Eric. Great minds think alike. Unlike other bike tour companies, Eric doesn’t use the cattle herd model for inspiration—Flambeaux limits the size of its tour groups to ten people per tour. That’s nice. It’s nice to not get lost in a crowd. It’s safer, too, when you’re pedaling down New Orleans’ often-confusing street plan. Guess what the maximum occupancy is at La Belle Esplanade, the #1 place to stay in New Orleans. If you guessed ten, you are correct. There is something enchantingly special about being part of a small group and getting the tailored attention you deserve. So, not only is Flambeaux Bicycle Tours personalized in the way La Belle is a small personalized hotel, Flambeaux runs on personality. Your tour guide will be an expert on all things New Orleans. He or she will get to know you over the course of a tour. Your guide will learn what interests you, and they’ll be able to tailor the information to what you want to know about New Orleans. It will be a fascinating ride full of pleasant surprises. New Orleans is what you make of it, and the city is very, very good. Photo courtesy of Flambeaux Bicycle Tours. NEW ORLEANS IS A LOT OF THINGS. IT IS ANYTHING BUT DULL. If you want to experience New Orleans like a New Orleanian, to learn what it is like to live here instead of visit like a tourist, I have one recommendation for you: Make a reservation at La Belle Esplanade, a place that is unlike any other hotel you have ever stayed in. 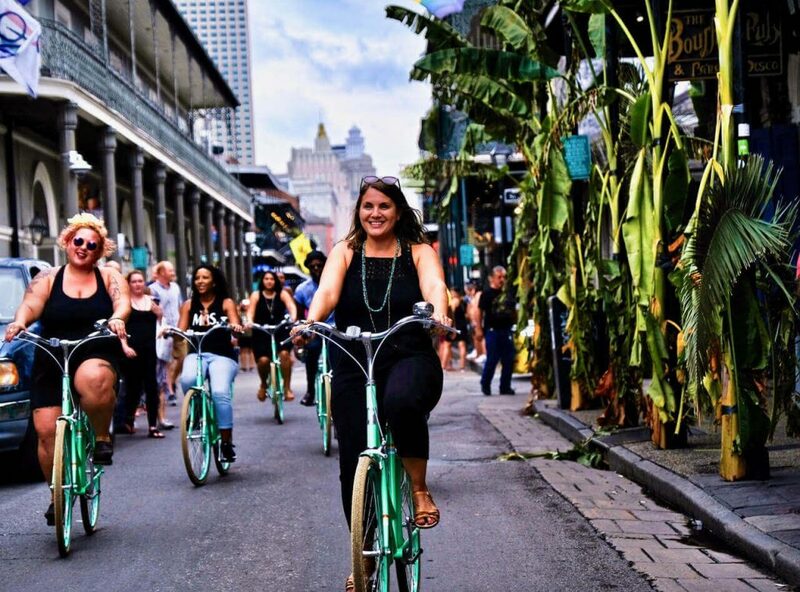 If you want to experience New Orleans like a New Orleanian on a bicycle, take a tour from Flambeaux Bicycle Tours. Learn what it means to fall in love with New Orleans. You’ll learn a lot. You’ll fall head over heels in love with New Orleans. Shine a light on New Orleans’ many secrets and byways off the usual tourist radar. This will be a bike tour unlike all others, in the best ways. Frau Schmitt and I are happy to partner with Eric by referring people to Flambeaux. We don’t get any kickbacks or anything like that. We like to keep things above board and honest. This is a recommendation from the heart. Frau Schmitt and I are New Orleans goodwill ambassadors. When we make a recommendation, it is because we believe in what we are recommending, because we believe that what we are recommending is best. We have no incentive beyond you leaving our fair city with good New Orleans memories that will last you the rest of your life. If you are looking for a bike tour, or if you are looking to rent a bike for a day, or for the duration of your stay, we recommend Flambeaux. If you need that link to their website again, CLICK HERE. If you need a link to our reservation calendar, for the perfect place to stay, you can click the blue “Check Availability” button at the top of this page, or you can CLICK HERE. We hope you have a great New Orleans day today, wherever you happen to find yourself. New Orleans waits for you.